When St. Nicholas’ Church was restored after being completely gutted in 1942 an organ was purchased from St. Mary the Boltons Church, Kensington, London in April 1959. It cost £4,500 to purchase and £8,000 to renovate and install. The organ was installed in the church by the John Compton Organ Company. The organ was built in 1876 by William Hill and was enlarged in 1880. William Hill was an eminent organ builder in the Victorian age. After modernisation in 1907 the organ became one of the most famous organs in the country. St. Mary the Bolton’s Church’s had been badly damaged in the Second World War and as its parish was unable to finance the necessary repairs, the organ was sold to St. Nicholas’ Church. It has three manuals and over 3,100 pipes. 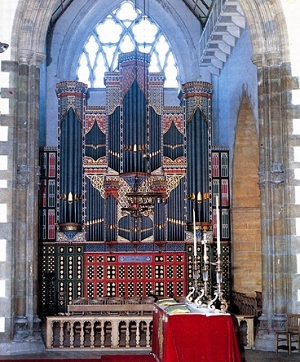 In May 1961 the organ case was decorated and became one of the finest coloured organ cases in England. 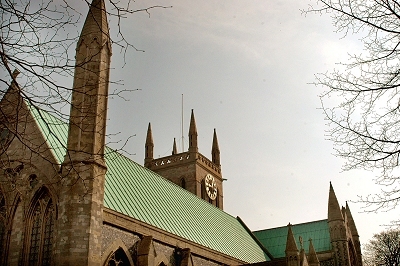 The design was by Stephen Dykes Bower. Its design is Gothic with detailed carving and painted with gold and colour to resemble a 15th century organ case. The case was donated by the Freemasons of Norfolk as a peace memorial and thanksgiving for victory in 1945. The organ now needs to be completely dismantled, cleaned, the bellows replaced, the fallen pipes re-erected, the copper couplers replaced etc. The task will take six months and estimates are in the region of £700,000. 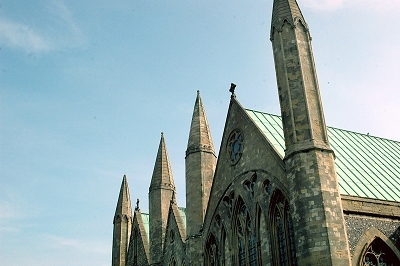 Now that the tower has been completely restored at a cost of £400,000, efforts are now concentrated on introducing proper heating throughout the Minster and making its west end more community friendly at a projected cost of £3.5m.